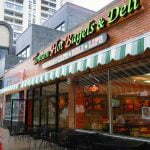 After scouting a new location for over a year, THB (formerly known as Towson Hot Bagels) will open the doors of its new location in Charles Village at 3208 St Paul Street by the end of 2016. The new 2,700 square foot store will be located on the ground level of 9 E. 33rd Street, the new student housing and retail project under construction at the prominent intersection of 33rd Street and St. Paul Street. The project is a joint-venture of Beatty Development Group and Armada Hoffler in collaboration with Johns Hopkins University. This location will also serve to showcase THB’s new brand and store layout. The restaurant’s marketing team engaged Streetsense, a Bethesda-based company, and local brand consultant Kait LeDonne of LeDonne Branding and Marketing to help bring this new vision to life. THB’s senior leadership team attributes the new location to Armada Hoffler, Beatty Development Group, and John Hopkins University for believing in the brand’s vision. “As a family-owned business, we are very lucky to have landlords who believe in us. Their support over the years has been a major part of our success,” says THB’s CEO Tony Scotto. That success includes winning Baltimore’s Best Bagels five times in Baltimore Magazine and gaining a cult-like following of young professionals, busy families, and college students. Charles Village was strategically selected because these demographics are present in the area. The new location, like the other three, will be supported by THB’s commissary, which will continue to guarantee the consistency and freshness of their menu. MacKenzie Retail’s Real Estate Advisors Michael Gioioso and Henry Deford represented THB in the transaction. The Landlord was represented by Matthew Stein of MSC Retail. For more information on future THB locations, contact Mike Gioioso at mgioioso@mackenziecommercial.com or 410.494.4866. For more information on Charles Village contact Tracy Roman at tracyr@thbgroup.biz or 410.828.0199.